Who is Required to have a Florida Mold License? This question just can’t seem to be answered by those that want to preform mold inspections or mold remediation and are on the hunt for a licensing loop hole. So who in the State of Florida is required a have license to preform Mold Assessments and/or Mold Remediation. The answer is simple. Anyone who advertises themselves as a professional providing mold assessments and/or mold remediation. If you provide mold assessments and you advertise your company or yourself as a mold inspection company or inspector you must be licensed by the state as a mold assessor. You cannot add someone else’s license number to your business card. That’s not legal, honest, or ethical. These actions will be reported to the State as unlicensed activity. You cannot call the collection of air samples for mold spores an indoor air quality test to avoid the need to obtain a mold assessors license. The collection of air samples for mold spores is a mold sample not an indoor air quality test so let’s just be honest with our clients and call it what it is and get licensed. You cannot assess the extent of mold damage on a home where you intend to provide the remediation. The law is very clear on this and is one of the primary reasons for the law, conflict of interest. Just call an independent licensed assessor to provide an assessment and then you can provide your estimate. If you provide mold remediation and you advertise your company as a mold remediation and emergency services company you must have a Mold Remediation license and the license holder must be onsite supervising the mold remediation. You cannot provide mold remediation under a general contractor’s license if you are advertising yourself as a mold remediator. You cannot provide mold remediation following a written mold remediation protocol under a general contractor’s license. You are no longer working within the scope of a Division 1 contractor. You are working within the scope of a mold remediator that requires a mold remediator’s license. So why did the state of Florida decided to require a license for mold related services? The Florida Legislature finds it necessary in the interest of the public safety and welfare, to prevent damage to real and personal property, to avert economic injury to the residents of this state, and to regulate persons and companies that hold themselves out to the public as qualified to perform mold-related services. Now let’s get to the individuals that believe they don’t require a mold license. First home inspectors and the answer is yes, a home inspector requires a mold assessor’s license to conduct a mold inspection and yes the collection of samples to identify the presence of mold requires a mold assessor’s license. As for the duct cleaners and air conditioning contractors, the answer is also yes. Anyone removing or identifying mold in a home or business requires a mold assessment or mold remediation license and that includes those in the air conditioning and duct cleaning business. There are exceptions to the law and those are listed below. Which brings us to the general contractor? Does the GC need a mold license? No. As the law currently states the prohibitions in the law do not apply to a Division 1 contractor as stated below. (d) Perform or offer to perform any mold assessment to a structure on which the mold remediator or the mold remediator’s company provided a mold remediation within the last 12 months. This paragraph does not apply to a certified contractor who is classified in s. 489.105(3) as a Division I contractor. However, the department may adopt rules requiring that, if such contractor performs the mold remediation and offers to perform the mold assessment, the contract for mold assessment provided to the homeowner disclose that he or she has the right to request competitive bids. (d) Perform or offer to perform any mold remediation to a structure on which the mold assessor or the mold assessor’s company provided a mold assessment within the last 12 months. This paragraph does not apply to a certified contractor who is classified in s. 489.105(3) as a Division I contractor. However, the department may adopt rules requiring that, if such contractor performs the mold assessment and offers to perform the mold remediation, the contract for mold remediation provided to the homeowner disclose that he or she has the right to request competitive bids. A Florida Licensed Mold Assessor or Mold Remediator must first take and pass one of the examinations approved by the department and administered by the American Council for Accredited Certification (ACAC). The ACAC has certifications for both the Assessor and Remediator, such as the CIEC Council-certified Indoor Environmental Consultant Required: 8 years’ experience consulting on indoor environmental issues including asbestos, lead, HVAC, building science, chemicals, mold and microbial contamination, or the CMC Council-certified Microbial Consultant Required: 8 years’ experience in designing and conducting microbial sampling regimens, or the CMRS Council-certified Microbial Remediation Supervisor Required: 5 years’ experience remediating microbial issues in the indoor environment, and the CMR Council-certified Microbial Remediator Required: 2 years, experience remediating microbial issues in the indoor environment. I would much prefer that my Mold Assessor or Mold Remediator be Licensed by the state and have the ACAC qualifications. Mold assessment is a process performed by a mold assessor that includes the physical sampling and detailed evaluation of data obtained from a building history and inspection to formulate an initial hypothesis about the origin, identity, location, and extent of amplification of mold growth of greater than 10 square feet. Mold remediation is the removal, cleaning, sanitizing, demolition, or other treatment, including preventive activities, of mold or mold-contaminated matter of greater than 10 square feet that was not purposely grown at that location; however, such removal, cleaning, sanitizing, demolition, or other treatment, including preventive activities, may not be work that requires a license under Chapter 489, Florida Statutes, unless performed by a person who is licensed under that chapter or the work complies with that chapter. These items are offered as examples of services you do need to hire a person with a Florida license and services you do not need to hire a person with a Florida license. The list is not all inclusive. 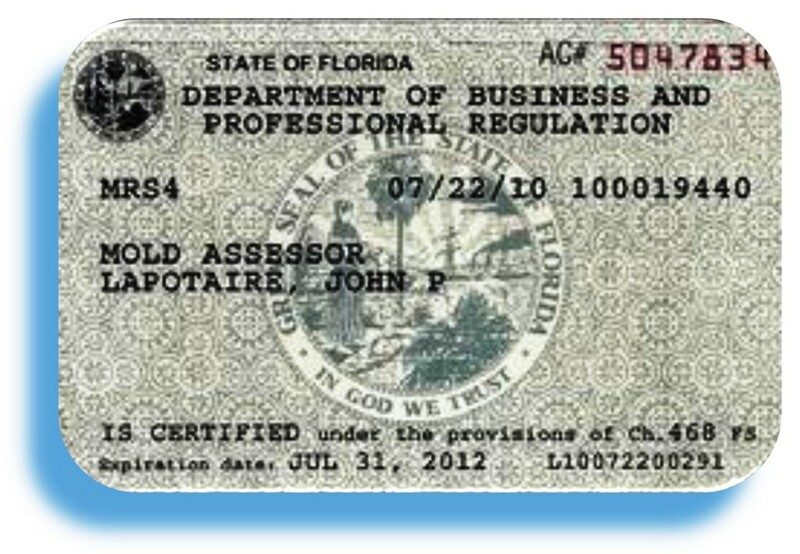 If you have specific questions, please contact the department at 850.487.1395 or review the rules for the profession at www.myfloridalicense.com. You should also check with your county or city to learn whether or not a local business tax receipt or certificate of competency is required for services that do not require a state license. Please visit our Unlicensed Activity page to learn more about how you can help us combat Unlicensed Activity. Advertising or representing oneself to be a Mold Assessor or Remediator. A residential property owner who performs mold assessment on his or her own property. Taking samples for purposes of testing for the presence of mold. A person who performs mold assessment on property owned or leased by the person, the person’s employer, or an entity affiliated with the person’s employer through common ownership. This exemption does not apply if the person, employer, or affiliated entity engages in the business of performing mold assessment for the public. A person who performs mold assessment on property operated or managed by the person’s employer or an entity affiliated with the person’s employer through common ownership. This exemption does not apply if the person, employer, or affiliated entity engages in the business of performing mold assessment for the public. A person working solely as an officer or employee of a governmental entity. Here are some Florida Mold License FAQ’s Frequently Asked Questions and Answers. Q What are the statutes and rules that govern the mold-related services Profession? Q What are the statutes and rules that govern the Home Inspection Profession? A Chapter 468 Part XV of the Florida Statutes and Rule 61-30 of the Florida Administrative Code. Q Where can I obtain the laws and rules of the profession? Q. If my company does both Mold Assessments and Mold Remediations, will I be required to get two (2) licenses (one for Mold Assessor and one for Mold Remediator? Q. Will there be additional requirements by DBPR to have an “applicators” license if the mold remediator applies chemicals to contaminated surfaces during a remediation? A. No, please see the definition of remediators as it allows the remediator to treat and do preventive activities. Q. Is there a provision that would allow those licensed by the Construction Industry Licensing Board (CILB) to perform mold related services as long as they stay within the scope of their current licenses? A. Yes, Section 468.841 F.S., exempts persons from the provisions of Chapter 468, Part XVI, when acting within their authorized scope of practice as licensed under Federal, state or local codes or statutes. Any person acting on this exemption must not hold himself or herself out for hire as a licensed assessor or remediator or any title implying licensure under Chapter 468, Part XVI. (b) Effective July 1, 2011, perform or offer to perform any mold assessment unless the person has complied with the provisions of this part. (c) Use the name or title “certified mold assessor,” “registered mold assessor,” “licensed mold assessor,” “mold assessor,” “professional mold assessor,” or any combination thereof unless the person has complied with the provisions of this part. (e) Inspect for a fee any property in which the assessor or the assessor’s company has any financial or transfer interest. (c) Use the name or title “certified mold remediator,” “registered mold remediator,” “licensed mold remediator,” “mold remediator,” “professional mold remediator,” or any combination thereof unless the person has complied with the provisions of this part. (e) Remediate for a fee any property in which the mold remediator or the mold remediator’s company has any financial or transfer interest. (a) A misdemeanor of the second degree for a first violation, punishable as provided in s. 775.082 or s. 775.083. (b) A misdemeanor of the first degree for a second violation, punishable as provided in s. 775.082 or s. 775.083. (c) A felony of the third degree for a third or subsequent violation, punishable as provided in s. 775.082, s. 775.083, or s. 775.084.